Hello! Welcome to Life Love Larson! If you are hopping over from Inspiration for Moms, I'm glad you're here! Don't you love Laura's effortless style? I'm happy to have become Instagram friends with her! I'm so grateful to Marty @ A Stroll Thru Life, for including my little blog in her home tours. I've been blogging for 8 years now, and I love being a part of these tours. I'm not a traditional "fall" decorator! I know, I know. I absolutely love the season, but I'm not naturally drawn to a lot of fall decor. I keep it simple inside with a few pillow/throw changes, add in some candles and always fresh flowers. I might add a few pumpkins and change up the mantel, but you're not going to see big changes from me. 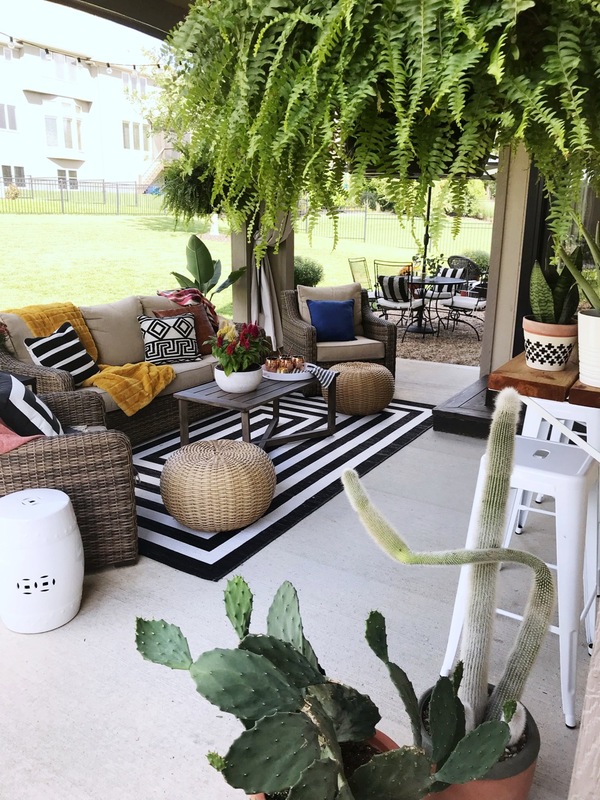 I do, however, love to decorate my porch and patio, which is what you will see today! Let's get started! This is fall to me! 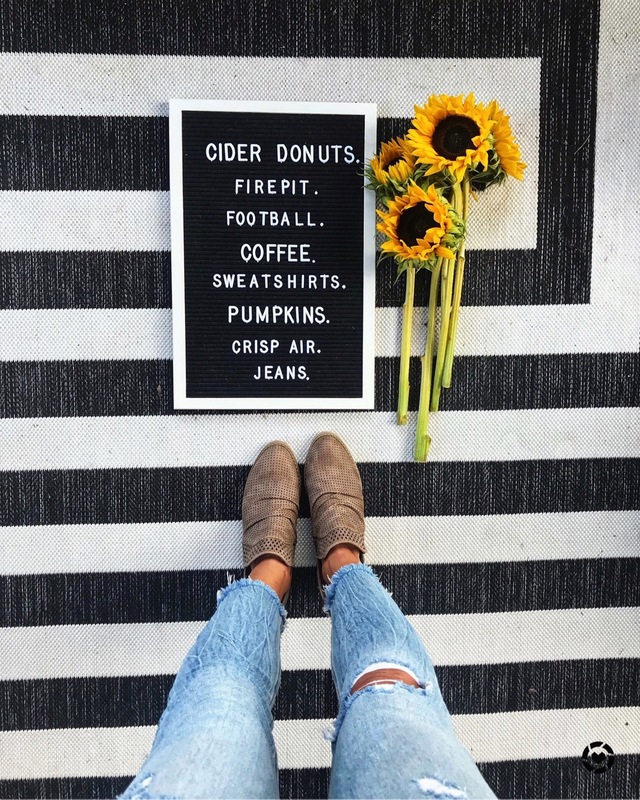 Give me all the college football and cider donuts and jeans and sweatshirts!! We live in midwest, so we are fortunate to get all four seasons. And Kansas City knows brings it for all of them! 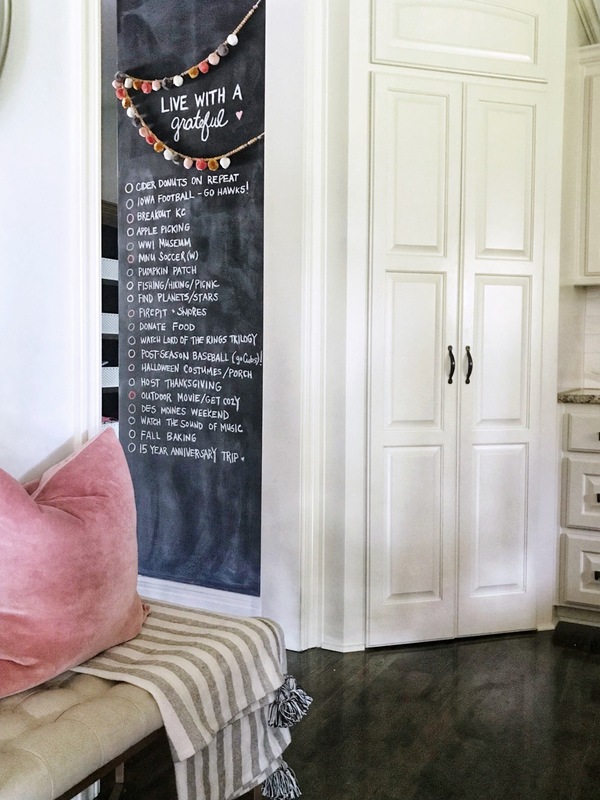 You can see our full Chalkboard Fall Bucket List here! 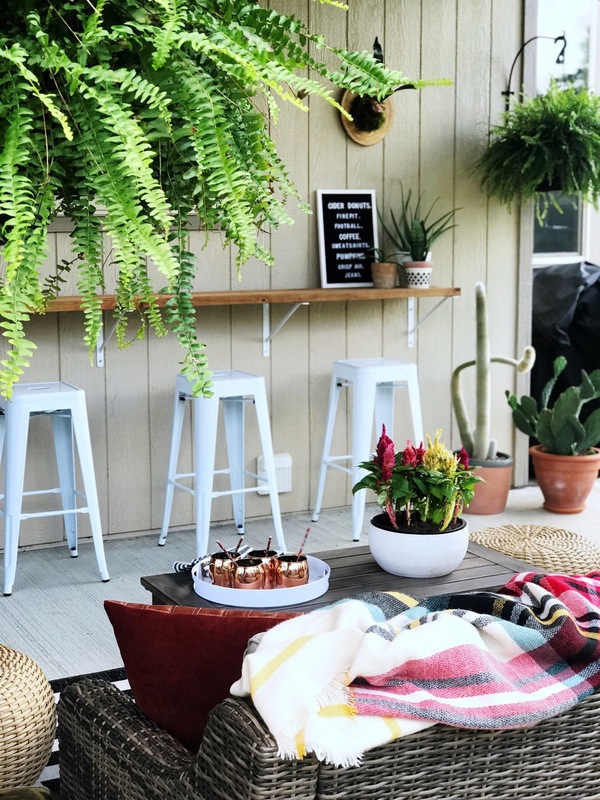 We recently did a little mini-makeover to our covered back patio space. We had a pea gravel patio installed and we got some new outdoor furniture. We LIVE out here! I love to have coffee in the morning and a drink at night. We watch TV out here, eat out here, and will be doing some entertaining out here this fall! I decided to use traditional "fall" colors out here and I love it! I incorporated some mustard, plaid, cozy throws, and a leather pillow. I love texture all throughout the year, but especially when the weather gets chillier. And I always love black/white. 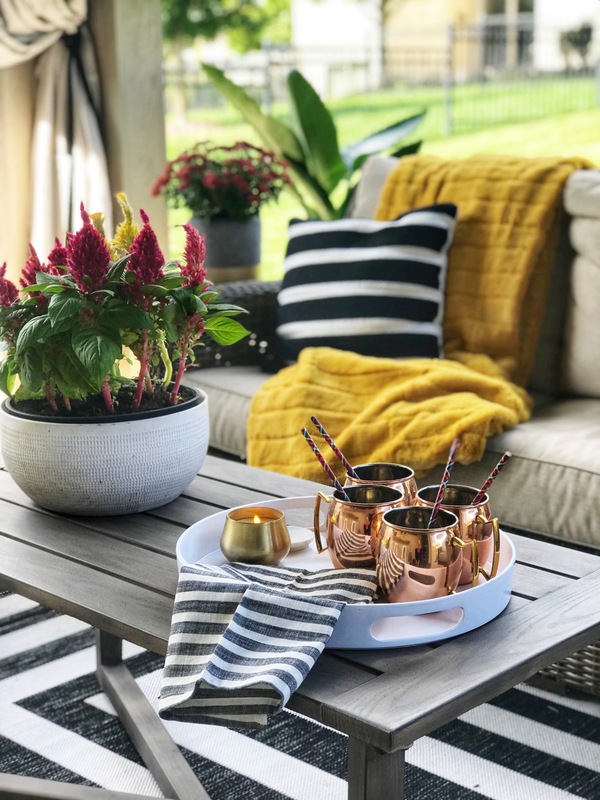 I always have terra cotta pots out here, which instantly adds warmth and texture. And give me all the plants! I'm a #plantlady! And these Bosten ferns are still going strong too! You can find a drop cloth curtain tutorial here! 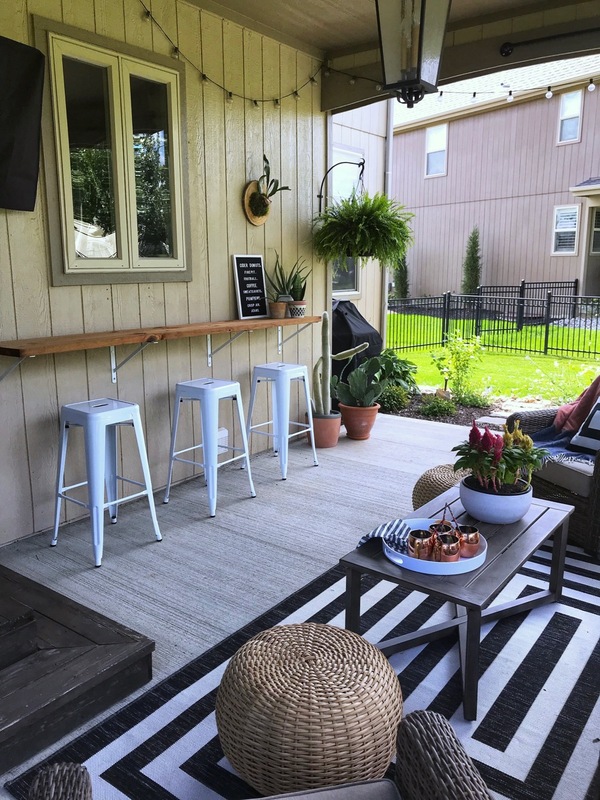 We installed this little bar top/serving area this summer as well. So simple, but so functional! 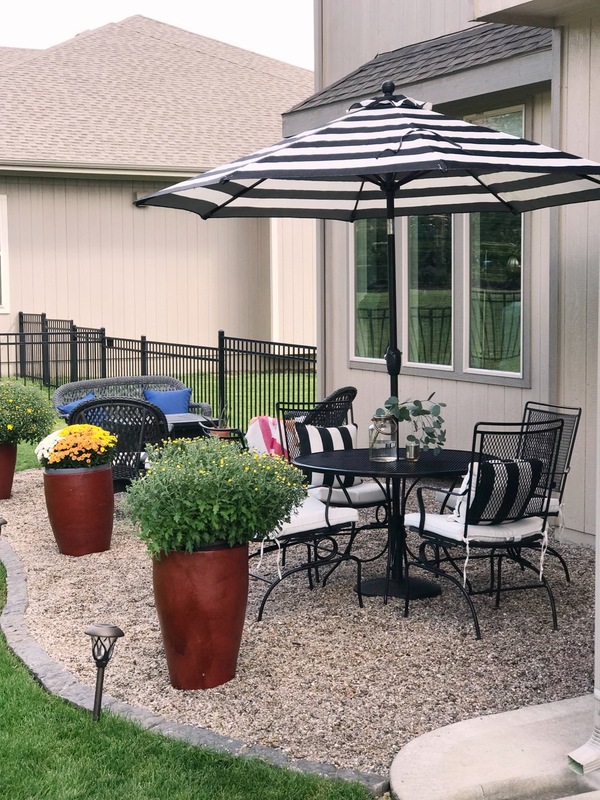 This is the pea gravel space that was recently installed. 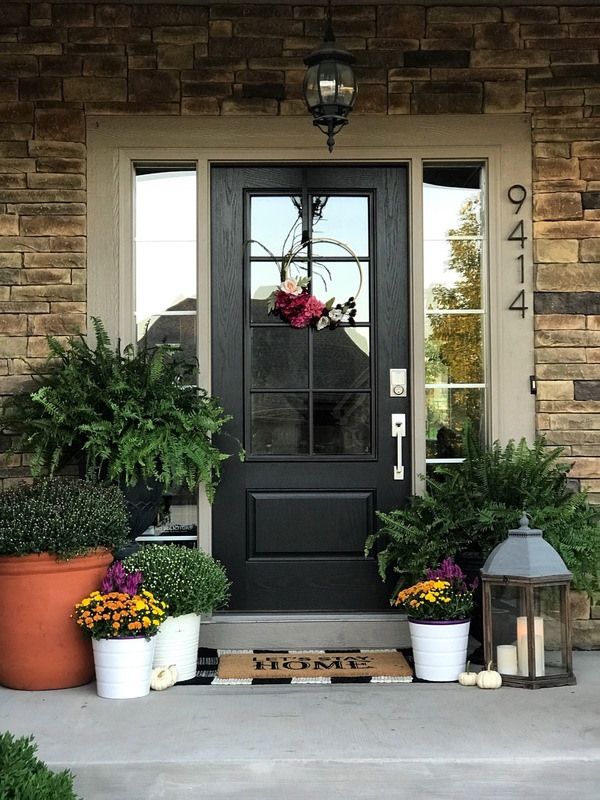 My husband found those large pots on clearance recently and they are the perfect fall touch back here! This area also houses our new gas fire pit! Looking forward to many nights spent out here with the chilly air! We have a very beige house, so I decided to liven it up with a little color. 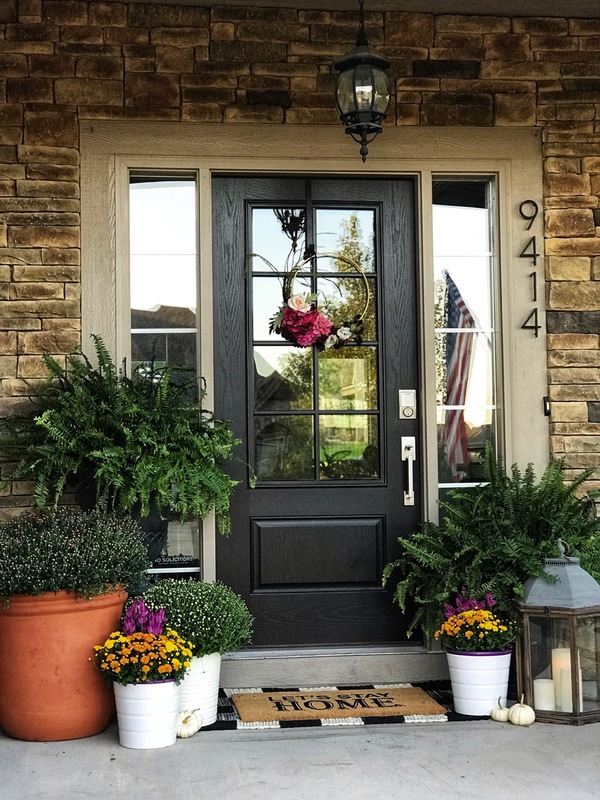 I found these pretty pots with yellow and purple and thought they would be a good punch against the black door. My Kimberly Queen ferns have been going strong since May! They are the gift that keeps on giving! 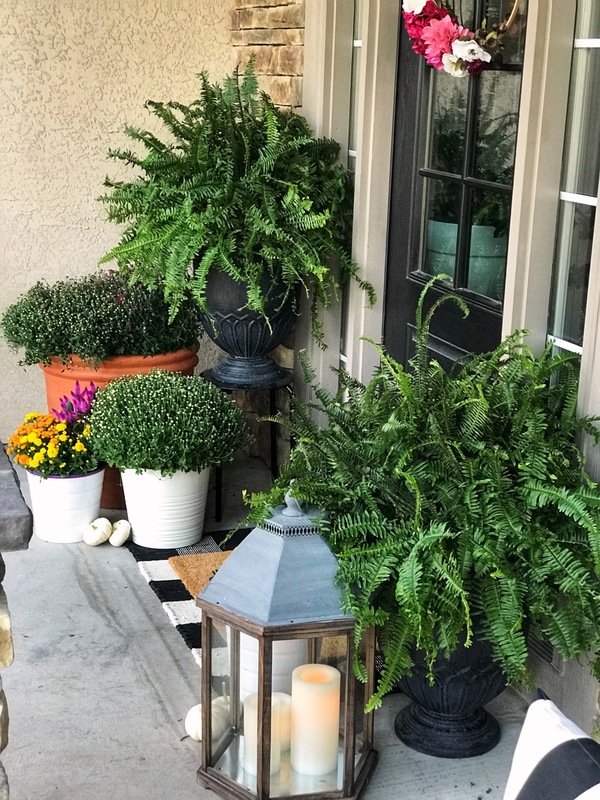 I love ferns incorporated into fall decor. I love the whimsy and the greenery of a fern. The large terra cotta pot was a recent find and I'm in LOVE! 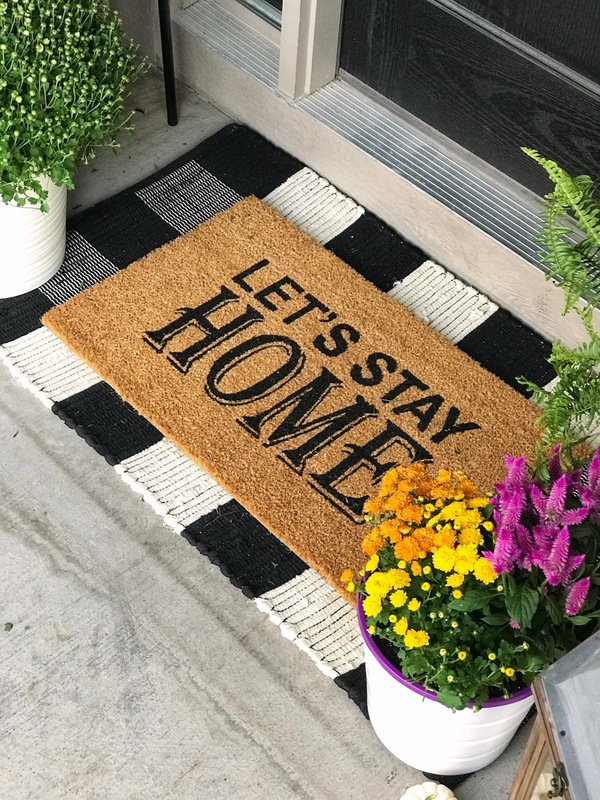 I also picked up a new front door mat and rug for fall/winter. Let's Stay In! We really do love to go and do and travel, but we also very much love to stay home and snuggle up as a family! I made this DIY fall modern wreath last year and it's a favorite of mine. 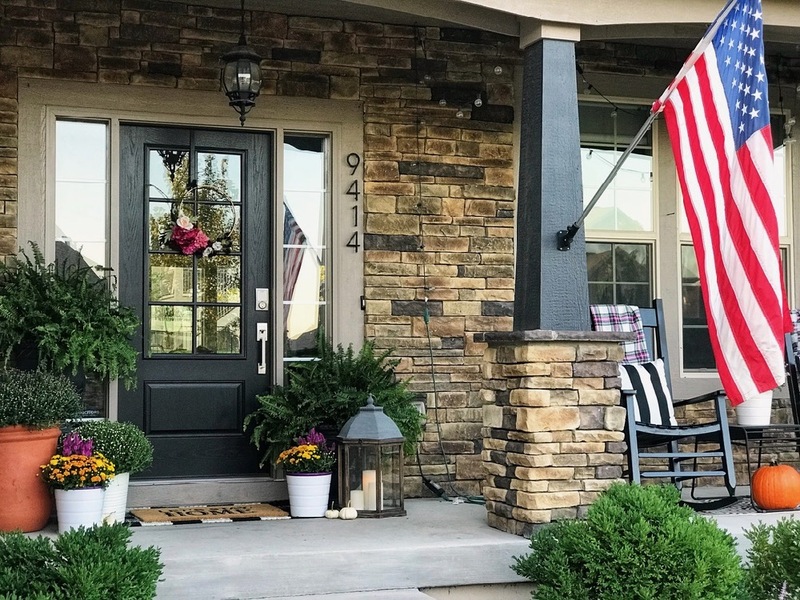 I love, love, love having a large front porch! Porch rocking out here is the best! 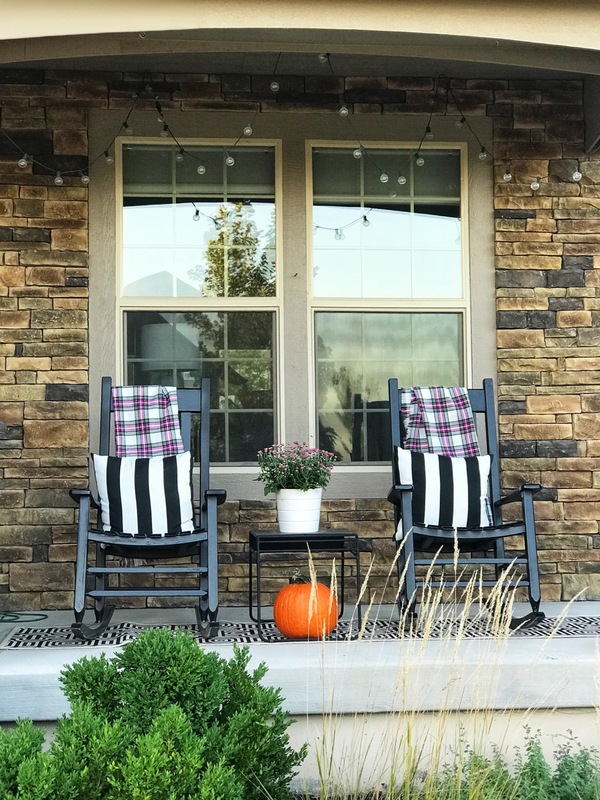 I added inexpensive plaid blanket scarves to the back of the chairs to give them some texture, pulling out some of the purple from the flowers. And I keep those black/white striped pillows on the rockers all year long. They work with every season and really are striking from a distance. I managed to find a few pumpkins! I know it's early, but I will be adding several more pumpkins as the weeks go on! 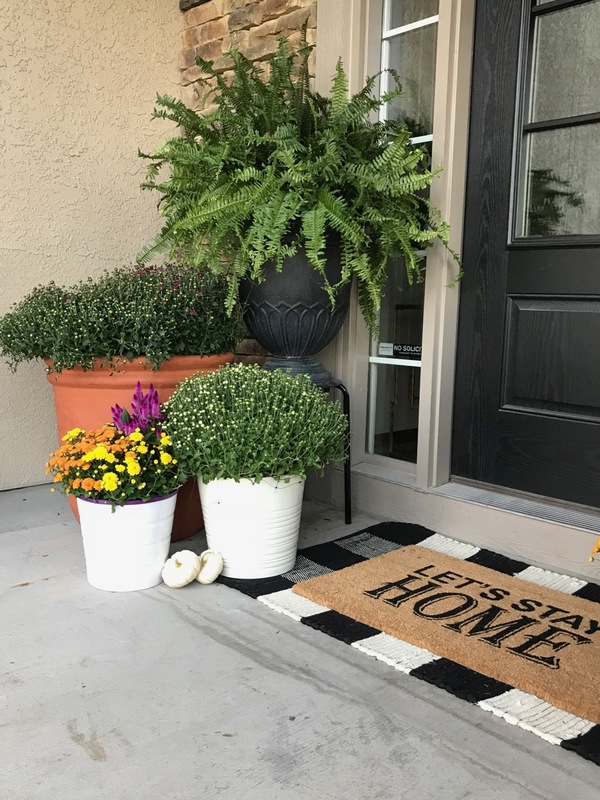 Layering mums and different sized pots, and adding some height on one side makes the space feel cozy and inviting! 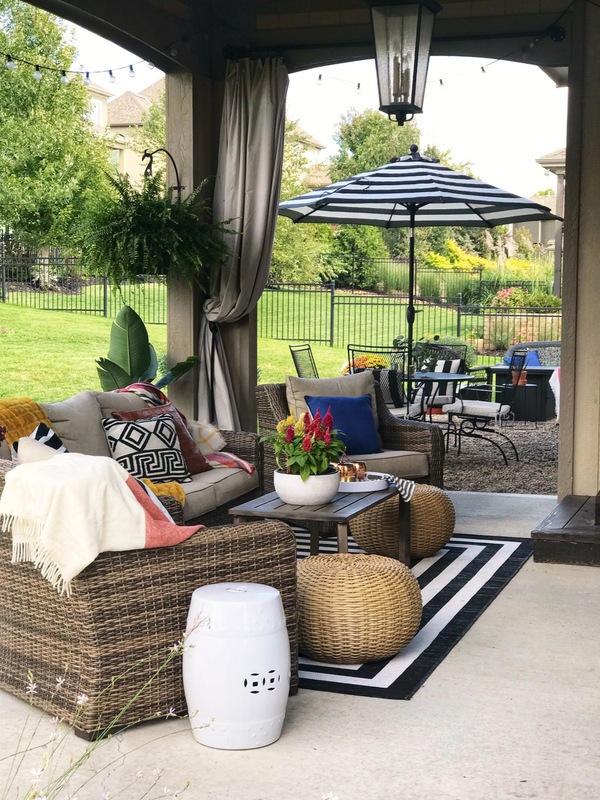 I hope you enjoyed getting a peak into our outdoor spaces decorated for fall! There is nothing better than spending time outside in the fall! Next on the tour is Monica Wants It. 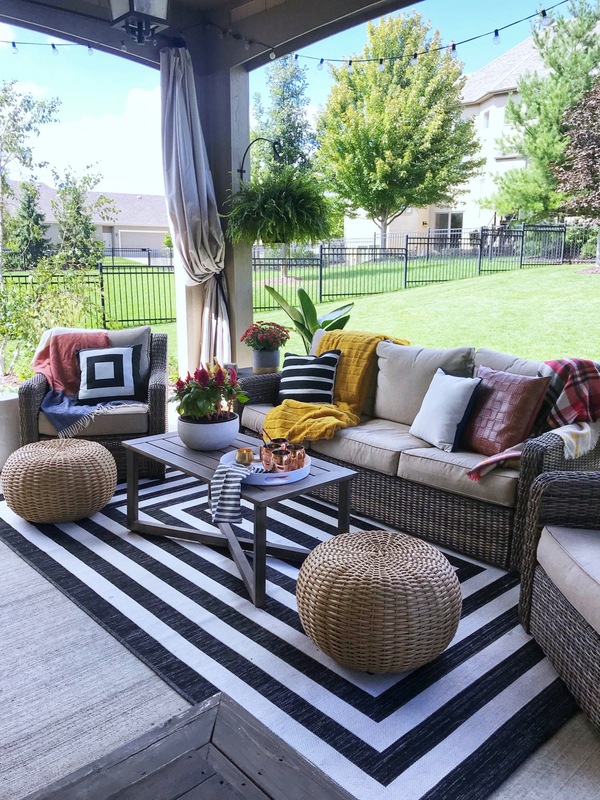 You will not want to miss her mix of colors and patterns! It just exudes happiness! 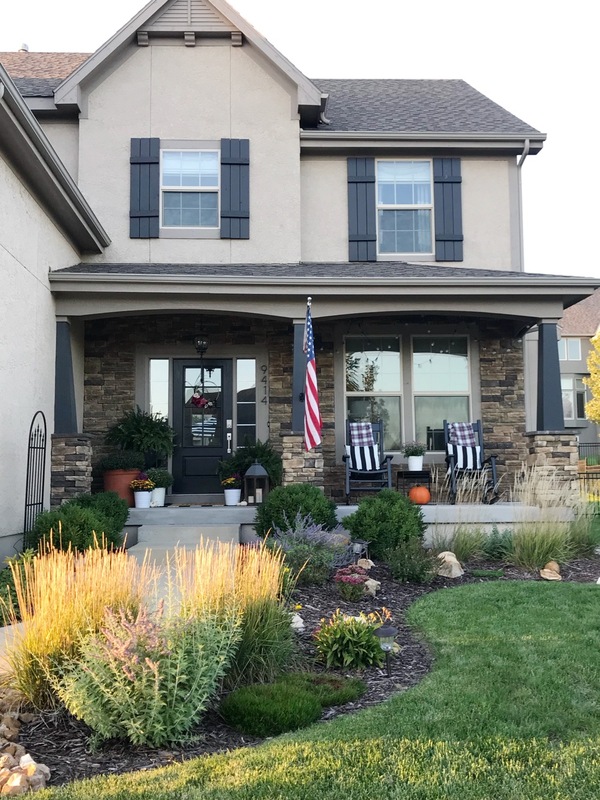 Don't forget to check out all of the home tours that have been going on all week long! And please connect with me on Instagram! It's where you can find me everyday! Happy Fall! I hope you all had a fabulous Labor Day weekend! It's officially fall now, right? Wishful thinking, it's still hot here! 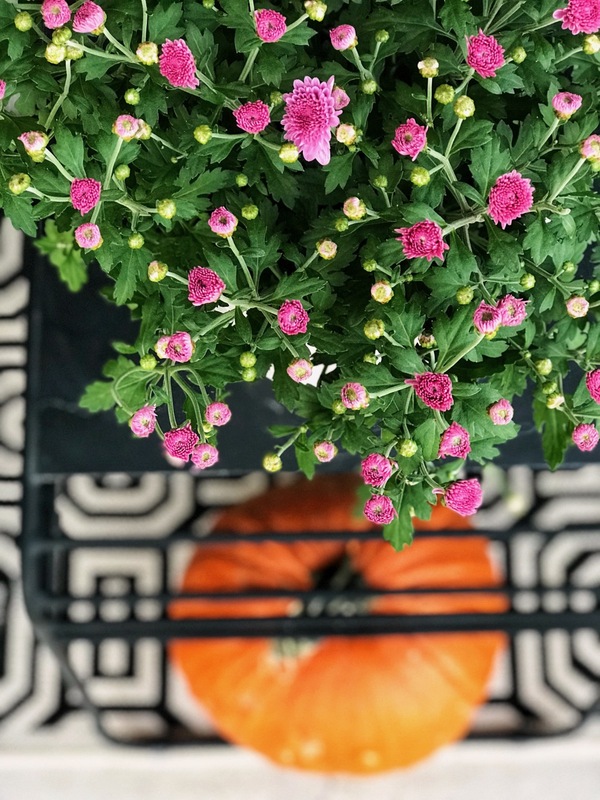 I'm going to be on the hunt for some mums soon, as all my summer plants kicked the bucket awhile back! It's time for another installation of the Larson Family Bucket List - fall edition! The kids and I sit down together and compile a list for every season. It has the usual suspects on here, and a few new things. This time of year is just the best! Jeans and sweatshirt weather. Fires and cider donuts. Yes!